A few months ago, I wrote about the ideal wine storage, and gave out a few tips on how to store wine without a wine cellar. Storing your wine for proper aging is important, and serving it at the right temperature is just as critical. Optimal wine serving temperature can turn a good wine into an amazing wine. No joke! Have you ever had a refreshing glass of water and told yourself it was the perfect temperature? The same feeling of satisfaction applies to wine when the optimal wine serving temperature is met. Red wines need to be served a bit warmer (55-65ºF) in order to reveal specific aromas and flavors. Rosés, whites and sparkling wines need to be served at a cooler temperature (43-53ºF) for a more refreshing and quenching feeling. When served too cold, a red wine will seem a little bitter and raw on your tongue and palate. The nose or bouquet will disappear entirely and the flavors will be quite dull. On the other hand, when served too hot, the wine may smell sweet and good (almost like jam) but the flavor will be dense and unpleasant, sugar heavy which won’t let you taste much else. We often mention “room temperature” for the ideal wine serving temperature. The subjectivity of the term doesn’t appeal to me. Room temperature might be 70ºF for some, but 8oºF for others. I generally prefer more specific references to make sure my wine is served at the right temperature. This maximizes the potential of a better tasting wine. Every wine is special in its own way, and temperature plays a crucial role in revealing the specific characteristics that make it special. 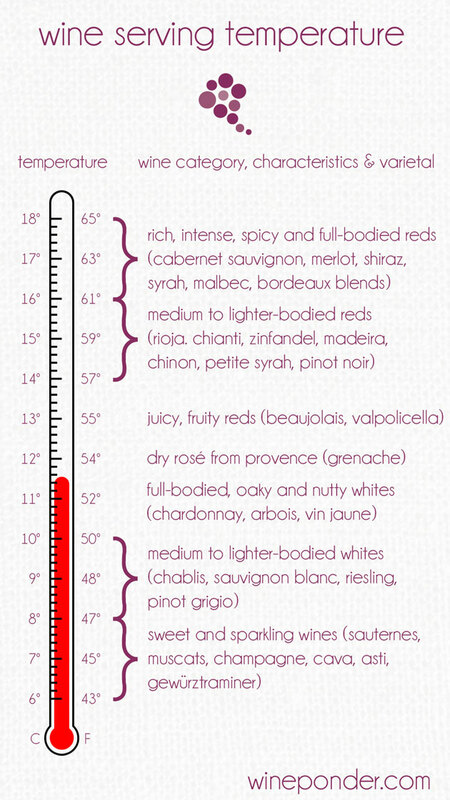 The following wine serving temperature chart recommends serving temperature for the most common varietals. As a general rule, typical temperature for storing red wine ranges from 52ºF – 65ºF, and 45ºF- 50ºF for white wines. • If you live in a very hot or cold location and have a wine collection, it is worthwhile to invest in a wine fridge or wine cellar. Alternatively, you can see if your local wine stores offer wine storage services. • Store your wine horizontally to keep the cork moist. This will minimize the probability of the cork cracking and letting air entering the bottle as a result. • Do not put the wine in the freezer! If you leave a bottle in the freezer for too long, the wine will freeze and expand. The bottle will explode, resulting in a big ugly mess. • Avoid too much humidity. The label will deteriorate after time and mold might start building around the neck of the bottle. Heat damage is wine’s death sentence. During those hot scorching days, the last thing you need is for your wine to go bad because of heat damage. Learn how to protect your wine against heat damage with this Wine ponder’s exclusive article. For more storing tips, visit one of our most popular articles “How To Store A Wine Bottle“.